If you are an experienced Mac user, you will agree that nothing compares to the smoothness of performance of these beautiful machines. The interface design, the animated micro-interactions, and the responsiveness – everything creates the illusion of a friendly being communicating with you. The more is your frustration when the being becomes forgetful and sluggish. Unfortunately, this often happens to older Macs or to some non-top of the line models with less RAM and disk space capacity. The reason is junk files left behind by deleted apps, cluttered logs and cashes and other issues that may hamper Mac’s performance. There are ways to tackle all these problems, but they demand technical knowledge and deep understanding of macOS. If you are uncertain of what to do, it is better to leave these tasks to maintenance software, specifically designed to take care of your Mac. I’ve seen a fair share of cleaning apps, so I know when I see a good one. That is why today I will introduce you to my new favourite. MacFly Pro is a multifunctional app, and it is as comprehensible and easy-to-use as you can get. In short, it restores your Mac to a shape that the manufacturers intended, by cleaning out the dead weight of no longer wanted data. It may surprise you how many junk files litter your Mac’s hard drive. Even if you are careful to delete everything you no longer need, there are still many inconspicuous (and often undetectable) files, duplicates, log entries and traces, cluttering up the precious disk space and hogging memory resources. MacFly Pro effectively tracks them down and clears them away, freeing disk space, which is crucial to maintaining the excellent performance that made Macs their name. Whether you saw a message ‘Your Startup Disk is Almost Full’ or you simply feel that it is time to de-clutter, MacFly Pro is likely to help you. 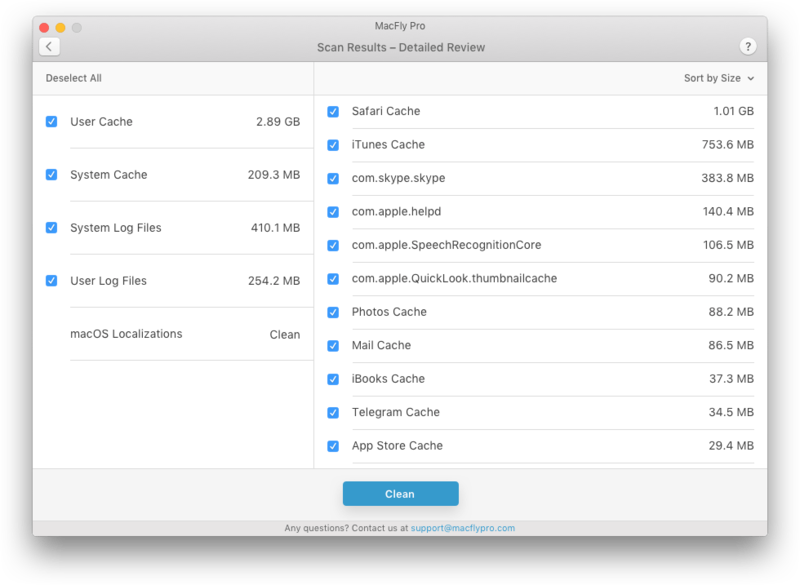 Once you have successfully downloaded and launched MacFly Pro for the first time, the app will prompt you to start a full disk scan manually. This may take a while, but it is the first and the last time you will have to do it. All subsequent scans are automatic and run in the background. From now on, the app will present you only with results of its regular scans, suggesting you to free disk space and delete everything that accumulated since the last cleanup. All you have to do is confirm the action. If you want more in-depth insight into the process, you may explore the various features of the app’s user-friendly menu and use its tools one by one, to have more control and understanding. MacFly Pro is a versatile suite of utilities – not unlike a Swiss army knife. Do not be alarmed, the numerous features are grouped quite handily into tree modules: Smart Assistant, Cleanup and Tools. Smart Assistant is the best feature for people who simply want things done quickly and without fuss. It conducts scans in the background, detecting things that interfere with your Mac’s performance. Based on the current state of your system, it will suggest improvements. All it needs from you is one click on the ‘Clean All’ button, confirming that you want to remove all the junk it has found. Cleanup is for techies who want to be in control of the process. Here you can check the most likely culprits of disk space shortage – unused macOS localizations and app languages, cashes, user and system logs, libraries left behind by deleted apps, trash, temporary files, etc., etc. They are invisible, but they take up space nonetheless, so getting rid of them may win you a surprising amount of disk space. Another nice feature inside this module, namely Memory, tackles some problems with your RAM usage. It is particularly useful for base Mac models with modest RAM capacity. Unfortunately, some of them are not upgradable, so you cannot physically add more RAM (which is most advisable, if possible). Therefore, the only solution is redistribution of RAM usage. If this is your case, Memory may significantly boost your Mac’s performance. Tools give you means for spring-cleaning, so to speak. With the help of this feature, you can find duplicate files, detect apps you barely ever use or large files that can free you a big chunk of space at once, should you decide to discard them. Do not worry, MacFly Pro only shows you the list of files, and it will not trash anything unless you tell it to, so you can rest assured that your data are safe. MacFly Pro is an elegant multipurpose app that Mac users appreciate for its user-friendly clean design, ‘native’ feel and trouble-free experience. 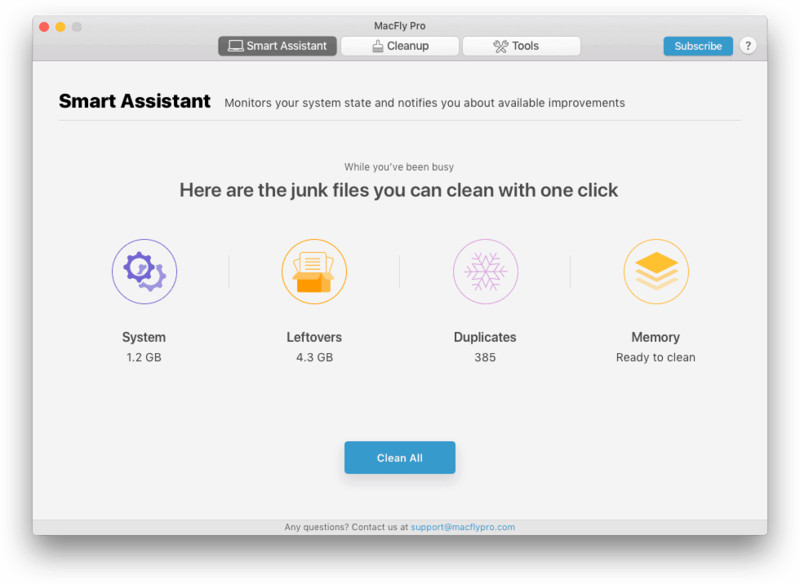 Unlike many notorious cleaning apps that get carried away with cleaning all and everything, MacFly Pro safely removes only the files you no longer want to keep.